Thuraya PREPAY Plan SIM provides flat calling rates throughout the Thuraya coverage in Africa, Asia, Europe and Australia. All calls are charged at 60 second increments, GmPRS - at 100-Kb data blocks. Thuraya PREPAY plan has initial validity of one (1) year from first call. If the account balance is below $39 at the renewal time, the account enters the 90-day grace period. Incoming calls are still possible. If the account is reloaded within the grace period, the existing balance will be restored. If the account is NOT reloaded within the grace period, the entire unused balance will be reset to zero and the account will be permanently deactivated. NEW! 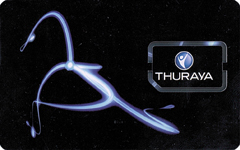 Starting April 1, 2019, a Thuraya prepaid account must be reloaded with $20 worth of airtime at least once every 365 days to maintain a positive account balance. The majority of world countries and territories fall in Band 1 destinations. The countries, territories and other satellite systems mentioned below correspond to Band 2 and Catch-All destinations. Calling to those destinations will result in a significantly higher calling rate and faster depletion of your Thuraya prepaid balance. Apr 1, 2019: In-network (Thuraya) rate call will increase from $0.99 to $1.19 per minute. Apr 1, 2019: A minimum $20 airtime top-up is required every 365 days to maintain a positive account balance.